The Lady Mountain Trail is an intricate stringing together of natural weaknesses to ascend the steep east face of Lady Mountain. 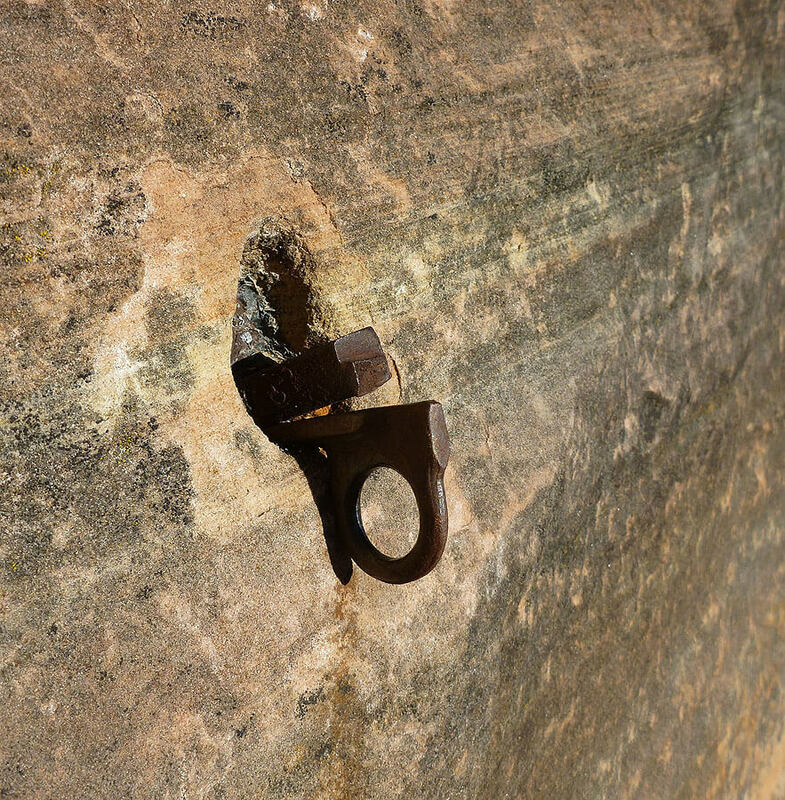 Short cliffbands are climbed with the assistance of antiquated trail hardware. Due to some sections of un-belayed 4th and 5th class climbing, this route is unsuitable for parties without a real rock climber and a rope. 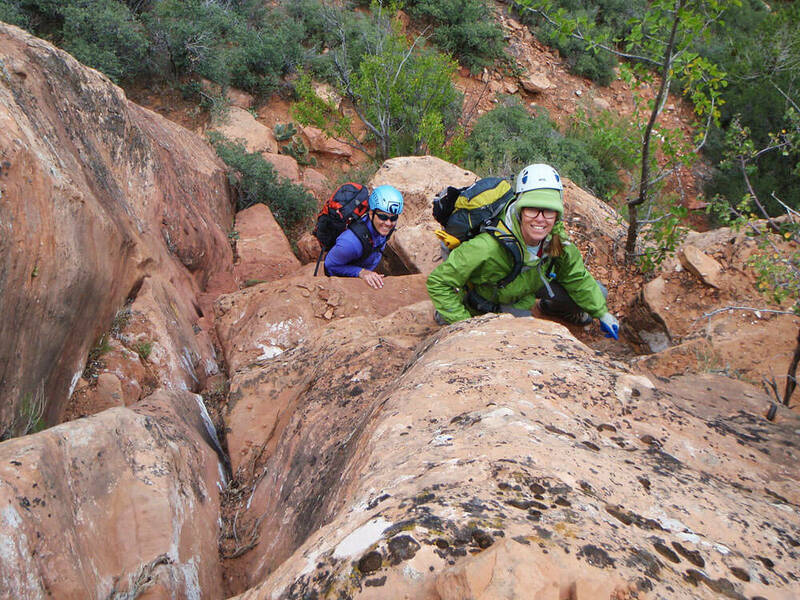 Completed in 1924, Lady Mountain Cable Route was one of the early human-made trails to reach Zion Canyon's rim from the valley floor. The Lady Mountain route used nearly 2000 feet of cable, 1400 carved steps and at least two ladders to achieve its lofty heights, ascending 2650 feet over just 1.9 miles. 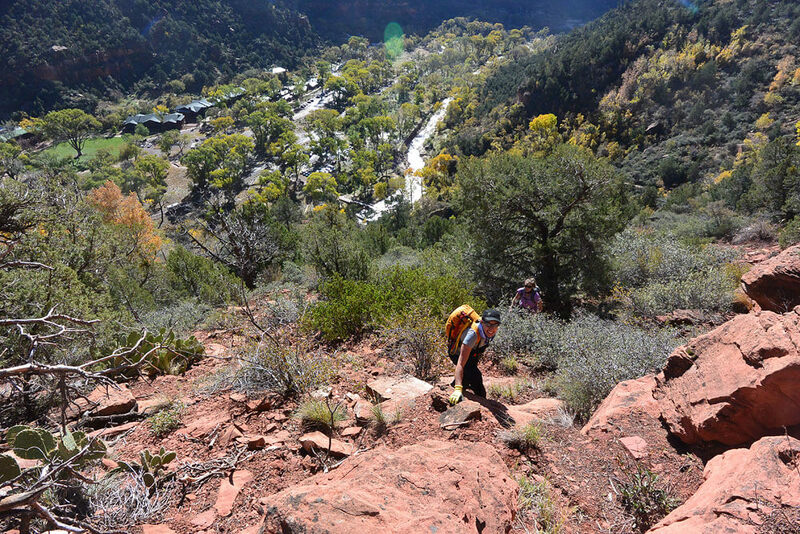 Located just across from Zion Lodge, Lady Mountain beckoned visitors who gazed upon the giant peak from the Great Lawn, and many adventurous ladies and gentlemen found their most serious Zion adventure here. Though the Lady Mountain Trail was popular for years, Park staff discontinued maintenance in the 1960's because trail equipment (chains, ladders, cables) was difficult to maintain. In addition, rescuing scared hikers was getting old. Eventually, all original hardware and signage was removed from the route, leaving it much more difficult. The present day "route" makes an interesting wilderness adventure, with several short 4th class sections and two short 5th class pitches worth leading and belaying. 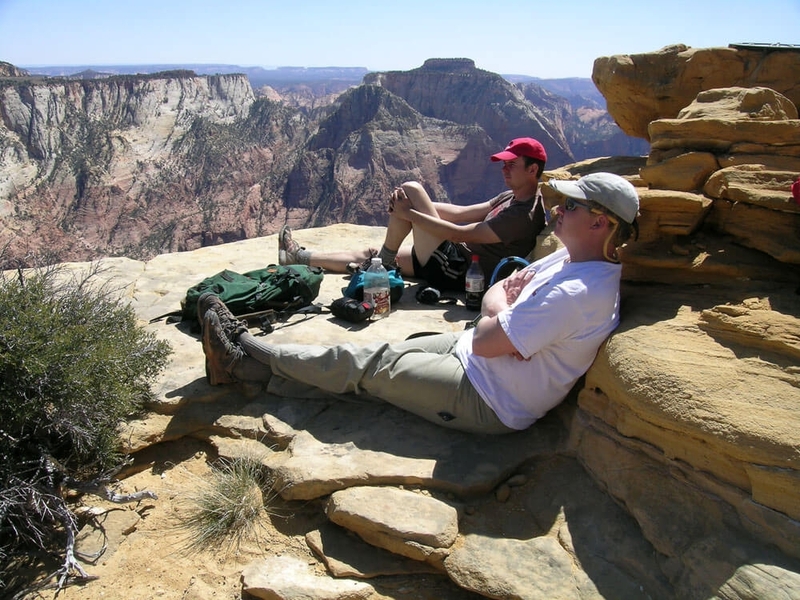 The summit looks DOWN on Angels Landing and provides commanding views of Observation Point, The Great White Throne, Deertrap Mountain, East Temple, West Temple, Castle Dome and Canaan Mountain. This makes an entertaining, very aerobic alternative to canyon grovelling on those pleasant days in the spring and fall. The route faces east, so it tends to be hot in the summer, except with a very early start. In winter, the lower parts melt out quickly, but the upper portion faces north, is enclosed and holds snow quite well. Some of the steep scrambling near the top might be quite difficult when iced up. While the two fifth-class climbing sections are short and have good holds, they ARE fifth class. The first is quite exposed. I highly recommend using a rope and belaying them, at least the first time up. You will probably like having a rope for the descent. 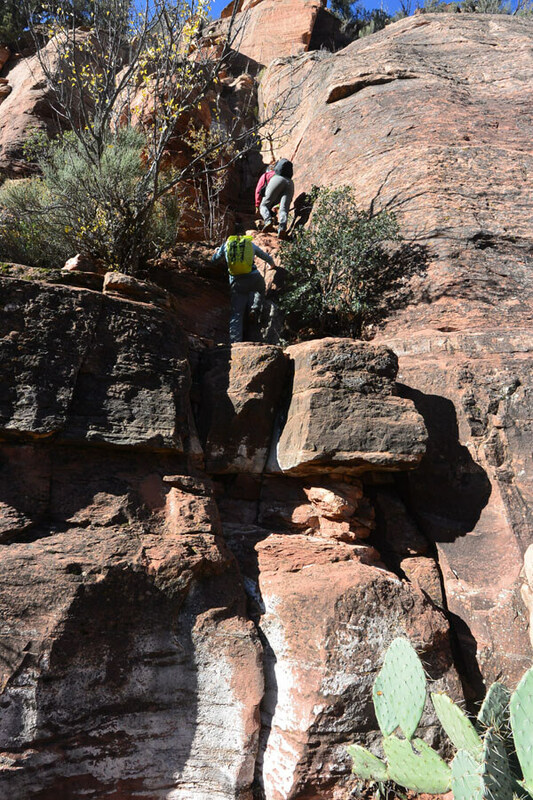 A scrambling, rugged, strenuous hike with lots of 4th class terrain. Fall or Spring, when snow-free. Hot in summer. 100 foot rope, harnesses and a few cams for short climbing pitches. Climbing-rubber type shoes, ample water, and food for a full day hike. Two short climbing sections, with difficulty up to about 5.5, plus several less-exposed 4th and easy 5th class spots. The approach to Lady Mountain uses the now-closed Middle Emerald Pool Trail. A landslide messed up this trail about 2010, and it is unlikely to be repaired anytime soon. From Zion Lodge, cross the river on the bridge and turn left, then right onto the closed Emerald Pool Trail as it climbs 200' through the landslide section to the bench above, then heads north. Follow the trail about 1/2 mile to the "The Canyon Grows Wider" sign, then 40 feet past the sign. A bit of a trail leads upward several hundred feet to the base of the cliffband; find a blocky chimney that offers easy passage through the cliffband. Climb the chimney. 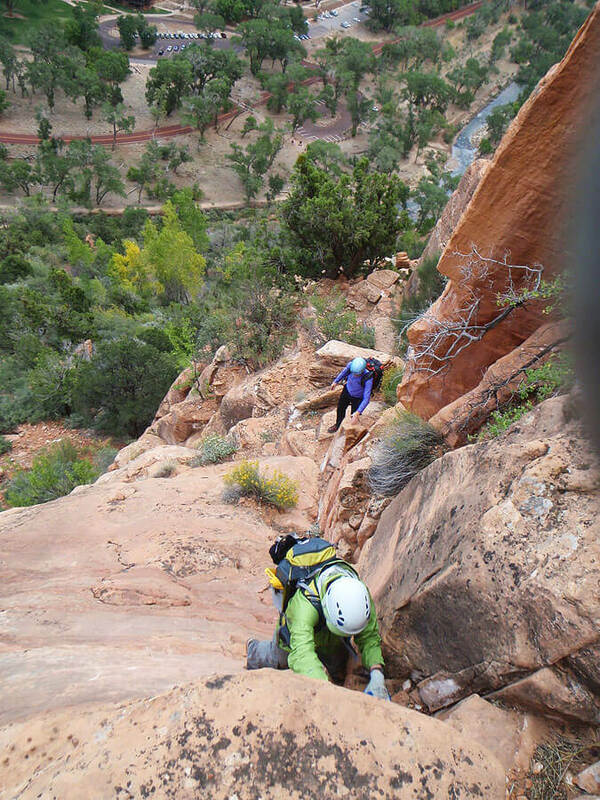 Just above, a steep chipped-steps section is made easier by handholds in a crack. Then follow the trail up and generally to the left. The route is intricate, but well-marked, with cut steps in many places and painted arrows in others. There are a few spots where the trail is not clear—DO NOT IMPROVISE, find and follow the trail. Further along, a somewhat trickier obstacle has balancy climbing on eroded steps. 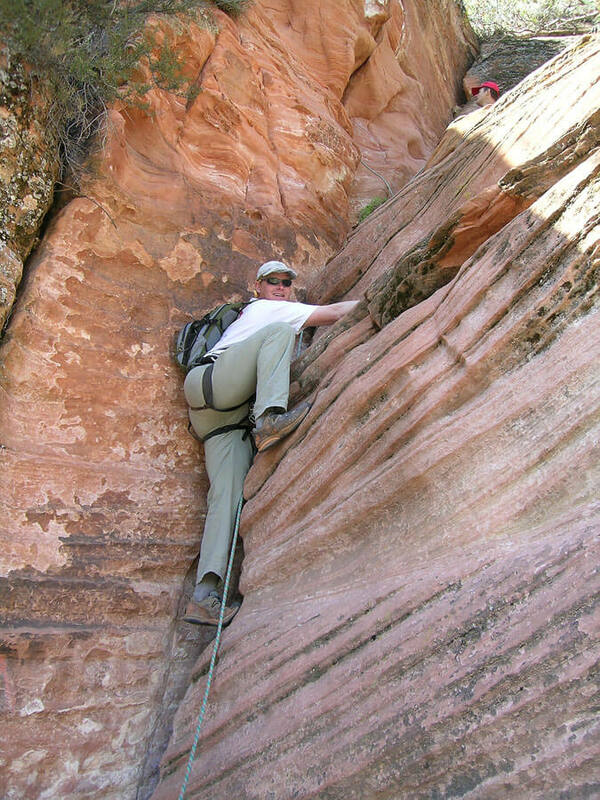 This part may require passing packs up or pulling them up on a rope. After about an hour, the first climbing crux is reached; many people belay. Step across a void into a short, steep chimney. There is a modern bolt for belaying at the bottom and a stout iron eyebolt at the top for rapping off. A finger-size cam or two might be useful. Continue upward. The trail wanders left, then up, then traverses a long way left at the base of slabs to a shrubby section that allows ascent. Climb dirt up to the second fifth class section. The second belayed section is kind of sneaky, as it doesn't look too hard from below. It is not too exposed, but the slope below is steep dirt and makes a poor landing, and the moves are awkward. A handcrack and right facing corner lead to horizontal ledges. Look for hidden holds. There is a single modern bolt to belay from at the top. A 1-1/2" cam might prove useful. The route continues upward, now working right following ledges and ramps into the upper gully. The route is more difficult to follow as it approaches the ridge, perhaps because people go several different ways. Find a reasonable way to the crest of the sharp ridge. Follow the ridge right to the summit of Lady Mountain. Return the way you came. There is usually a cairn marking the best route down from the crest of the ridge. I first climbed Lady Mountain on a hot August day in 2001. Much of the charm was missed in the heat. I have climbed it a few times since, by itself, mostly in late fall. The route is used for access to Jacob Canyon, the canyon between Lady Mountain and Jacob, which I descended twice in 2013. 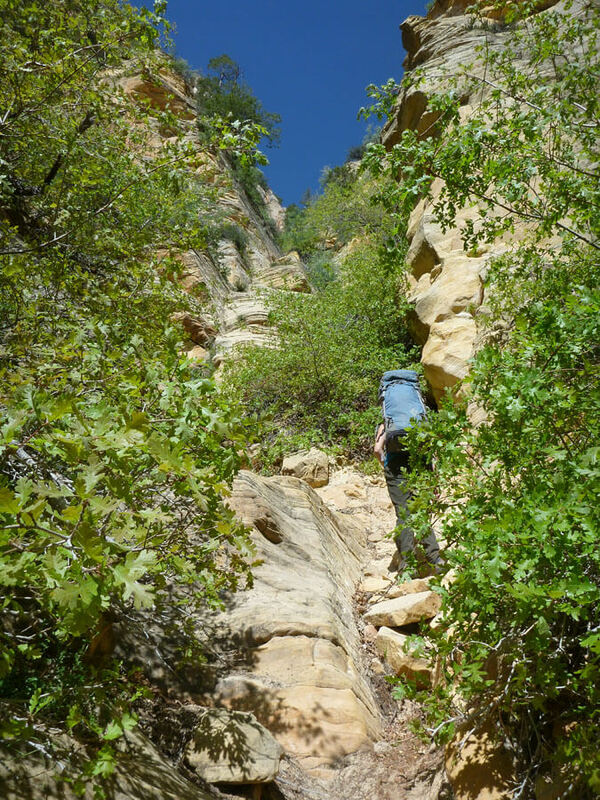 The route is used for access to Jacob Canyon, the canyon between Lady Mountain and Jacob. Jacob Canyon in Zion National Park: Poison Ivy and Fiddlesticking! A rematch was called for, obviously! Our trip of May first had left part of the canyon undone. And a bunch of rope stuck.